The number one thing that I recommend, for those about to delve into purchasing their first DSLR, is to purchase a stand-alone body, rather then the camera/lens combo. The reason for this is that generally speaking, unless you purchase a higher end model of camera, the lens that comes bundled with the camera is often not a very good lens. The camera bodies will improve over time, and the quality of the lens will show in the images. So, what do I recommend? For an entry level DSLR I don’t think you can go wrong with the Canon Rebel line. For example the Canon EOS Digital Rebel XSi from Adorama is an affordable stand-alone body. Next up I recommend something called a ‘prime’ lens, such as the Canon EF 50mm f/1.8. A prime lens is a fixed focus length lens, which means that is does not zoom, you have to use your feet to zoom in or out. Now, this may sound inconvenient, especially if you are photographing fast moving children. But there is a reason I recommend a prime lens, and it has to do with light. You may have noticed the f/1.8 in the above product name and wondered what it meant. Basically it has to do with the amount of light that the lens lets in, the smaller the number, the larger the opening (if you think of it as a fraction, it makes more sense, it is easy to see that f/1.8 is larger then f/5 for example). Why is more light important? Because it will allow you to shoot in lower light situations without using the flash (which generally ruins the atmosphere of the scene). Having a brighter lens allows for lower ISO values, ISO also controls the amount of light in an image, but with high ISO (more light) also comes degradation of the image. The Canon 50 mm f/1.8 is what is sometimes referred to as the ‘nifty-fifty’, a very inexpensive plastic lens, but a good starter if you have budget constraints. If you can afford to spend a bit more, I would recommend the Canon EF 50mm f/1.4 or, even better, the Canon EF 85mm f/1.8. I have owned the Canon 85 mm f/1.8 (before I upgraded to the Canon EF 85mm f/1.2L, which is in a whole other category), and currently have the Canon 50mm f/1.4 mm, but definitely preferred the image quality of the 85mm f/1.8 over the 50mm f/1.4. The other reason that I recommend a ‘prime’ lens for the first lens is that it’s a good starting point for your photography. Some photographers don’t know what kind of photography they want to do at first. Will they want to take telephoto images (subject is far away) or wide-angle images? Starting with a fixed focal length lens can help you realize what is it you want to be able to capture, however it can definitely be handy to have a zoom lens, especially if you are photographing children. For a second starter lens I would recommend the Canon EF 28-105mm f/3.5-4.5 II. This will allow you to shoot a bit wider, at 28mm, but also have the ability to zoom in on your subject at 105mm. The price you pay is that this lens isn’t very bright. At 28mm it has an f-stop of f/3.5, at 105mm it is f/4.5. It lets in a lot less light then your fixed focal length prime lens. But having the two lenses will give you the best of both, a great lens for lower light conditions and a more versatile lens for shooting outdoors in brighter conditions. Oh, and one more benefit for your brighter prime lens? You can achieve the beautiful out-of-focus background called ‘bokeh’ with a larger aperture lens. This is one of the reasons I upgraded to an even brighter prime lens with the Canon EF 85mm f/1.2L II, I just LOVE the bokeh I can achieve with it, see the examples show below. Part of achieving bokeh also has to do with the ratio of camera to subject/subject to background, but the beauty of digital photography is you can play and learn! I hope this blog posting has helped you, if you are in the market for a new camera and lens. Please post any questions below in the comments, I’ll visit regularly to answer them. Thanks for your overview of lenses. I’m also a Canon person, JSO in the photography business. You really think the Canon EF 85mm f/1.8 is better than the Canon EF 50mm f/1.4? Why is that? I would love the Canon EF 85mm f/1.2L but can’t afford it. I tend to use the second one more both inside and outside. Of the two, which would you prefer? If I had to sell one and replace it, what would you sell and what would you buy? Suggestions are appreciated. Your work is gorgeous. I would like to one day be a member of the NAPCP… but I think I need to expand my portfolio first. Hi Jennifer, thank you for the kind comments! I originally owned the Canon 85mm f/1.8, but sold it when I purchased the Canon f/1.2L (because I obviously didn’t need two 85mms!). I would have loved to have kept it, though, because it’s an awesome lens. At the same time that I purchased the 85 f/1.2L I also purchased the Canon 50mm f/1.4 lens, as I thought it might be handy for tighter situations when the 85mm was too long. In reality I barely use it, unless I want to travel light (i.e. took the Canon 5D + the Canon 50mm f/1.4 on a trip to Disney with the kids, MUCH lighter then traveling with the Canon 1DMkIV + 85mm f/1.2L). I found the Canon 85mm f/1.8 to be far superior to the 50 f/1.4, much sharper, better color and contrast from the lens, which is why I recommend it over the 50mm. BTW I would not recommend the Canon 50mm f/1.2L, as it is not known to be tack sharp wide-open unlike the Canon 85mm f/1.2L which is known for that. In addition apparently the 50 f/1.2L has issues with focusing at minimal focus distance (tighter framing), though performs better at longer distance to subject (which makes sense as depth-of-field increases with distance from lens to subject), but that would really limit the use of the lens. 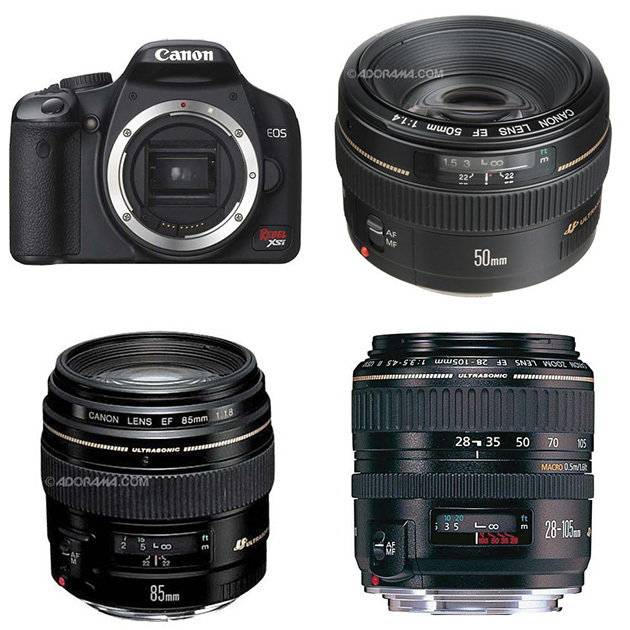 Of the two lenses, I would prefer the Canon 55-250mm f/4-5.6, but I prefer to shoot longer then wider. Giving up the other lens will cause you to lose out on a wider angle option, however. A brighter prime lens would definitely be a plus in your situation since neither of the lenses listed is very bright. Especially helpful for shooting inside a clients’ home. HTH! Let me know if you have any further questions. Helped a ton… I might bite the bullet and go with the Canon EF 85mm f/1.8 as my next lens purchase… not sure when though. Can I ask a couple more questions as they pertain to lenses? * Do you use a lens hood? When and why? What kind? I don’t currently have one. * Do you add filters to your lens? When, why and what kind? I have a UV filter I leave on my lens for both indoors and outdoors – good idea? I’m starting out with the Rebel Xsi. I’m hoping in a year or so when I’m bringing in more business to upgrade my camera body. What would you recommend? What would be a natural progression? I also have filters on my lenses, but you hear arguments both ways on that one. Some people think it’s crazy to have a (relatively) cheap filter on an expensive lens, but I’m of the option that I’d rather something happen to the filter then the lens itself. I think my filters are basic UV filters, I just keep them on all the time. As for which camera to upgrade, it depends where your skill and business is at. I started with the then Canon 30D, upgraded a year later to the Canon 5D (sold the 30D) and then four months later purchased the 1D MkIII (have since upgrade that body to the MkIV). The Canon 1DMkIV is my primarily body and the Canon 5D is my backup/second body. 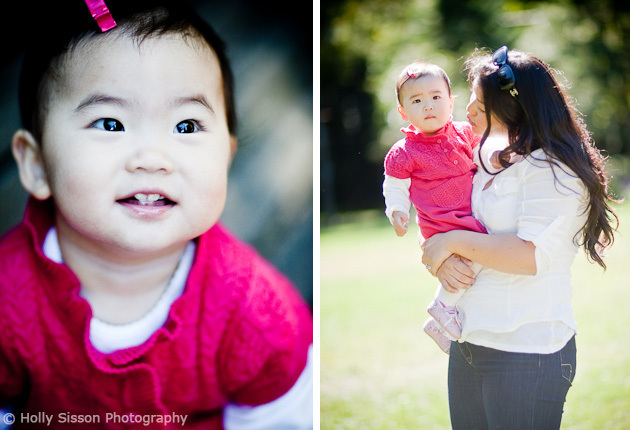 When I’m on a family shoot I shoot with both. Tomorrow, at my food photography shoot, I’ll bring the 5D as backup but will shoot with the 1D MkIV. I have had equipment suddenly fail—one night, before a food shoot the next day, my 5D was completely dead, thankgoodness I had another camera body! The next logical step up from the Rebel line would be the EOS 50D or 60D (or whatever it will be called in the future). Just remember that it always makes sense to invest in the lenses, because you’ll keep them from camera body to camera body. Though they generally have a fairly good resale value, so you should be able to recoup some of the investment if you buy and upgrade to a better quality lens. HTH, have to get to bed now! I am a Canon girl too!